Bedlam: A Historical Perspective of England’s First Institution for the Mentally Ill. I am a firm believer in providing as accurate and visual a picture of the time period for my books as possible. And I love doing research. But sometimes a writer playing detective by delving into the past can come upon historical research that proves more upsetting than they’d anticipated. For example, while researching an important backstory element for my upcoming novel, Between the Shadows, I found myself venturing into dark, frightening territory. Enduring love, although something humans all desire, cannot be forced or contrived. Emotion and trust must develop as an individual develops and comes to accept themselves. Truth is, no matter the time period, life can be difficult. 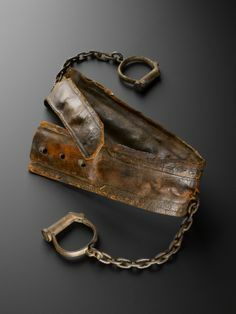 For someone impoverished or without protection, especially a woman in the early 19th century, it could be bleak and brutal. Someone once told me that the key to writing a book that kept the reader enthralled was to put your character up in a tree (so to speak) then throw rocks at it. Obstacles. Challenges. Danger. Whether real or imagined, what happens to the character should be compelling, riveting. Just like life in the 21st century, how we deal with illness, struggle, dangers, the oppressive challenges and risks, or seemingly hopeless heartache, can either conquer our spirit or make us stronger. I must admit, I relate more to characters that are not only searching to find themselves but challenged on their journey. As a reader, you want them to succeed, to have hope, and find love, acceptance, and happiness. The harder you must fight for something, physically and/or psychologically, the greater the victory. More than anything the protagonist in Between the Shadows wants to find acceptance, love, and be free of her personal demons. But in order to achieve that she must face one life-threatening challenge after another, not knowing who to trust, and all the while haunted by her greatest fear–the ticking clock of Bedlam. So, today I would like to share with you some of the research I have learned about this facility and its tragic history. Since its beginning in 13th century London, Bethlem Royal Hospital has been known by many names. In 1247, it was used as a priory for the sisters and brethren of the Order of the Star of Bethlehem. Located in Bishopsgate, it was called Bethlem. In 1330, Bethlem changed from a priory to a Royal hospital controlled by the City of London. It should be noted that mentally ill patients were not allowed at this time. In the early 1500s, there were 31 residents called inmates housed at Bethlem. It wasn’t until 1700 when these mentally ill individuals were finally referred to as “patients”. Let’s just pause a moments to think about this absurd milestone. It took the administration of this so-called hospital exactly 363 years to reconsider and change what they called the people under their care. In fact, it can readily be said that the progression of proper psychiatric care for the mentally ill at the hospital moved at a snail’s pace. 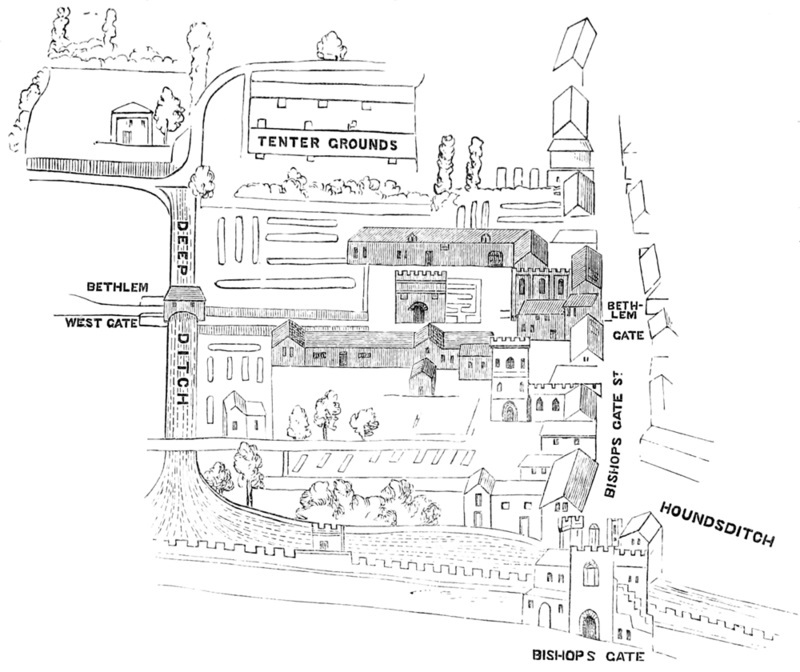 Pictured is a map from the 16th century showing the layout of Bethlem Royal Hospital in Bishopsgate. The facility had a church, courtyard, some stone buildings, and even a garden. However, the 31 inmates at Bethlem at that time saw little (if anything) of its courtyard or garden. Most spent their days and nights in some form of restraint, imprisoned in a dank, bitter cold environment that offered little hope for compassion or any type of comfort. After 1557, the management of Bethem Royal Hospital was transferred to the Governors of Bridewell. A Keeper was given the sole responsibility of managing the facility on a day-to-day basis. This Keeper received payment from parishes or the relatives of inmates. Consequently, the extent of care, comfort, or consideration that might be given to an individual was dispensed based on how much payment, if any, the Keeper had been given. For those poor souls without friend or family, one can only imagine the cruelty imposed. 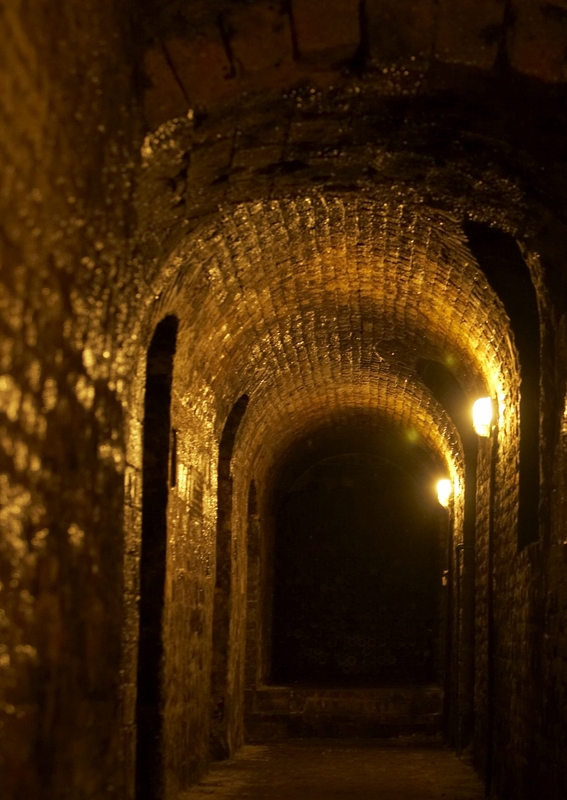 To get a better perspective on how foul the facility was at this time, apart from the horrific treatment given to its patients, an inspection in 1598 revealed terrible neglect of the hospital’s cesspit, known as the “Great Vault”. Mind you, this was just one of the areas cited as being in deplorable condition at that time. In the midst of this rotting, stinking facility, there were 20 patients housed there. One poor soul had been there for over 25 years. 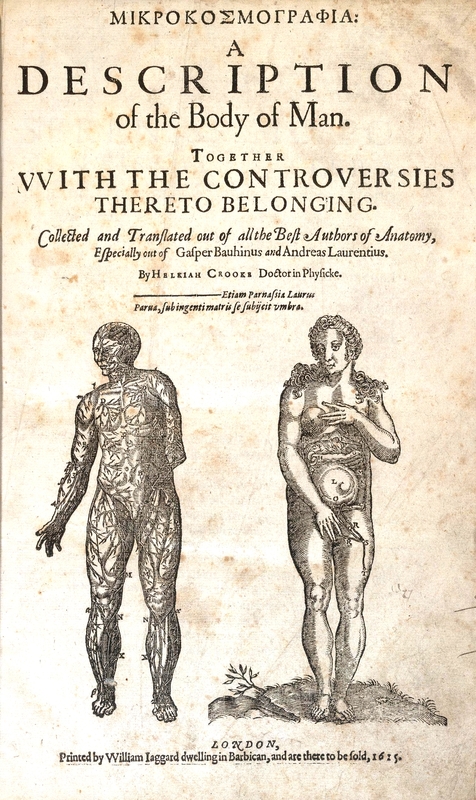 In 1619, the Governors’ appointed Keeper, Thomas Jenner, was replaced by Helkiah Crooke, who not only had the ‘favor’ of King James I, but was the author of a book on anatomy entitled, “Microcosmographia: a Description of the Body of Man [pictured]. Yet despite Crooke’s monarchy approved title as Keeper-Physician, he did not provide medical care. Rather, he continued the hospital’s mismanagement and was rarely present at the facility. In addition, he embezzled funds whilst the inmates were starving. Despite all the allegations against Crooke, it wasn’t until King James I had died and Charles I became king that an official investigation into the Keeper-Physician was made. Ordered by King Charles I, the investigation exposed the outrageous behavior of Crooke, and also revealed that the hospital steward had been stealing goods (such as clothing) donated to the hospital and food intended for the inmates. What the steward didn’t keep for himself, he had the audacity to sell to the inmates. Once again, those who didn’t have money or anything to ‘trade’, went hungry. Needless to say, Crooke and the steward were dismissed. In 1634, the day-to-day management of the hospital changed. Instead of the Keeper-Physician, the facility had three highly educated, medically trained individuals to oversee daily operations. An apothecary, non-resident physician, and a visiting surgeon were hired by the Governors. Although it seemed the Governors were concerned about the operation of the hospital, the physical neglect, abuse, and often bizarre treatment within its walls continued. Outside its walls, the hospital became the object of public scrutiny, too. Among the constant complaints from citizens living nearby was noise “hideous and great” echoing from gaping windows that held no glass, the foul stench of human excrement that permeated the air from the ‘Great Vault’, and the unsightliness of decaying buildings. Yet despite the ongoing neighborhood protests, it took almost 100 years for something to be done. In 1675, the inmates of Bedlam were relocated to Moorfields, situated outside the city proper. Robert Hooke (a noted scholar, inventor, polymath, and architect befriended and influenced by none other than the great Christopher Wren) designed the hospital’s impressive new buildings. The Court of Governors continued to elect the trained medical staff, but appointments were based less on qualifications and more on social connections. Nepotism would also play a major factor. In 1728, James Monro was given the salaried appointment as Bethlem’s physician, and had total control of the facility and its daily treatment of patients. His appointment began a 125-year dynasty of his family holding this position. Patients were divided into two groups, the curables and incurables. However, wards to separate these two groups of patients from one another was not implemented until 1725-34. And since the incurables were often dangerous, consider the poor, frail, and frightened individual being placed alongside them without any intervention or protection. 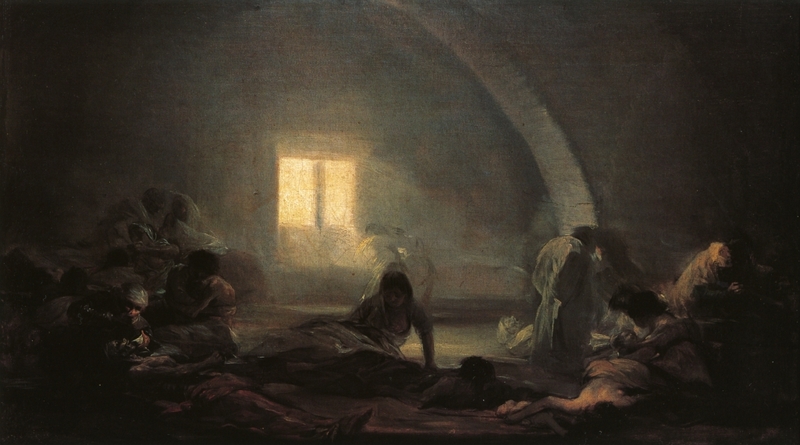 One might think that by the 18th century, compassion and genuine concern for the ill-treatment of these patients at Bedlam might have become more prevalent. After all, some of these people must have had families. For those that did not, surely the church felt it their Christian duty to see to the poor and ill. However, such compassion was not the case. Instead people found a twisted form of entertainment by going to see the “Show of Bethlehem”. 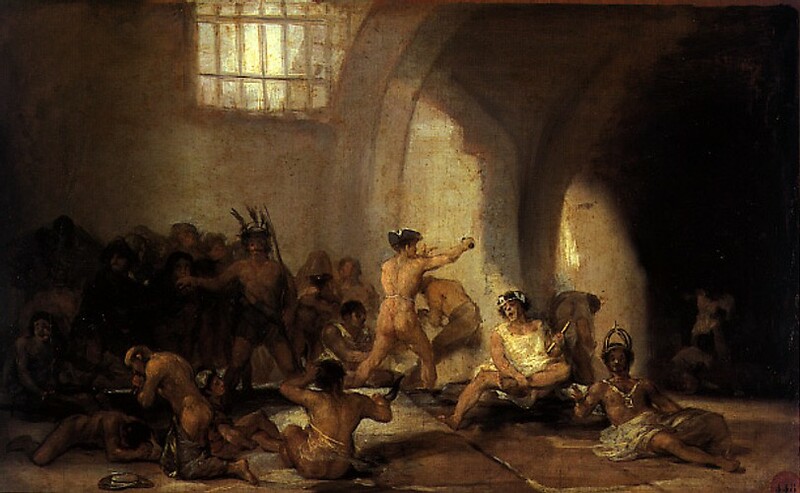 For a penny, they gained admittance into Bedlam so they could stare and laugh at the poor souls held captive there. For the more cost-conscious citizen, entry was free on the first Tuesday of each month. Because madness was often considered a sign of ‘moral weakness’, there were other citizens who visited the hospital to impress upon reckless family members what terrible fate awaited them if they continued their immoral living. People came to stare at the ‘curables’ and ‘incurables’ of Bedlam by the thousands. In 1814 alone, 96,000 people came to “visit” Bedlam. Ironically, at this time, King George III was also being treated, albeit privately, for madness. Still, the depraved conditions and horrendous treatment of the mentally ill continued. Not only did they suffer frightening treatment for their illness, they were subjected to mocking and cruelty by the public. 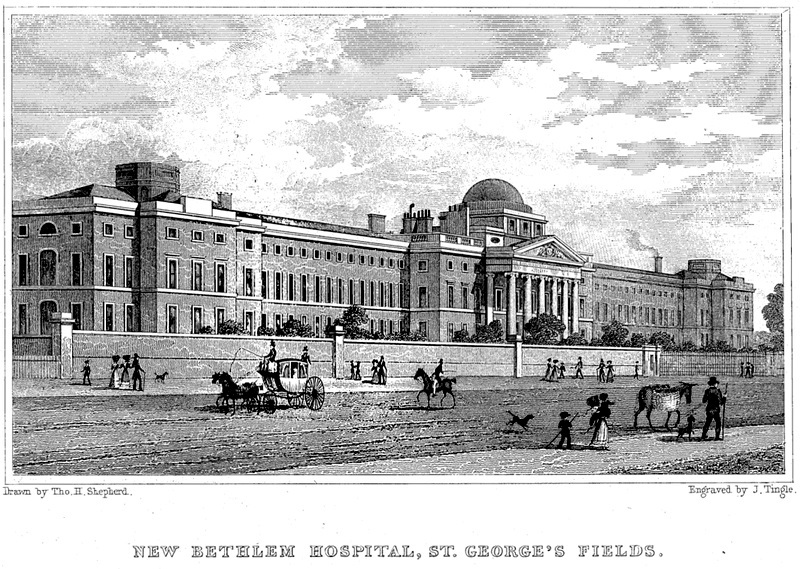 In 1815, after 140 years in Moorfields, Bedlam was relocated to St. George’s Field in Southwark. The architecture designed by James Lewis included an annexed library and a ballroom. In addition, steps had been taken to address how patients should be treated. They were now called “unfortunates”; one must assume it seemed a more compassionate term of the time. Men and women were housed in separate wings, but they could gather together in the evenings to listen to music and even dance in the ballroom. One must assume that those patients allowed to do this were more controlled in their behavior. At chapel, however, patients were separated again. Unfortunately, contrary to the ballroom dancing privilege (which might have been done more for public relations purposes than the welfare of the individual), neglect and inhumane treatment of the “unfortunates” continued. The same year the hospital moved into its grand new building in Southwark, a report of Bethlem Royal Hospital proved it was still Bedlam inside. According to one Dr. Connoly (in his report to the House of Commons), he saw: “patients each chained by one arm or leg to the wall, each wearing a sort of dressing gown with nothing to fasten it. Many women were locked up naked with only one blanket”. “Sleeping cells were either exposed to the full blast of cold air or were completely darkened”. Patients diagnosed as incontinent were kept in the damp, dark basement with nothing but straw on the floor. A year later, in 1816, glass was installed in the window, although not glazed. A new wing for the criminally insane was also built in 1816, where 45 men and 15 women were secured. At the Parliamentary Committee on Madhouses, a proponent for “lunacy reform” named Edward Wakefield provided crucial testimony. Having toured Bethlem several times to review how patients were being treated, he cited the “thuggish nature of asylum keepers”. Methods of threatening, intimidating, and punishing patients was considered viable treatment for their illness. 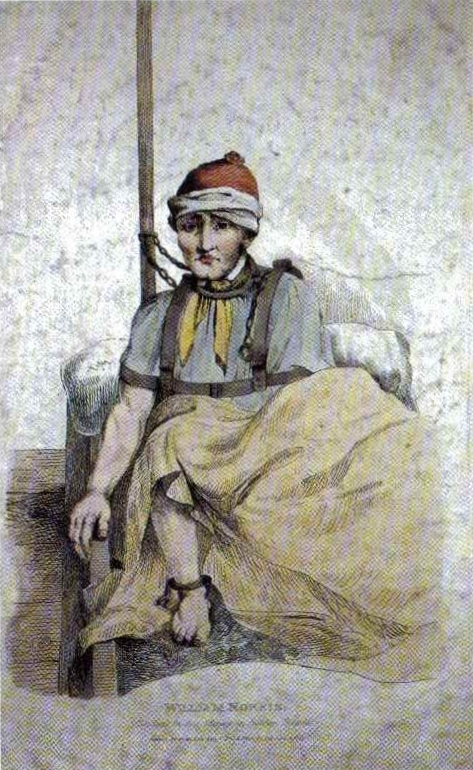 Shock treatments such as ‘cold bathing’ were also implemented whereby the patient would suddenly drop (without warning) through a trap door into ice cold water. The practice of confinement to various degrees also continued. 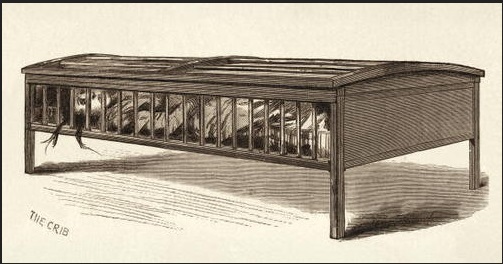 Devices for confinement included feet and wrist manacles, an early form of a strait jacket, and a restraining bed (or crib) that more resembled a casket with bars where the patient could not move or even sit up. A primary focus of Wakefield’s testimony was the care of a 55-year old American marine named James Norris. 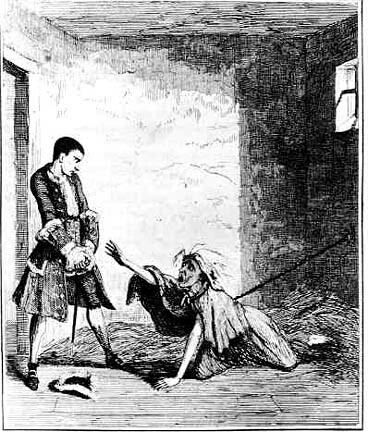 In 1800, the American had been detained at Bethlem on allegations of ‘lunacy’. Yet it wasn’t until 1814, when Norris was discovered in isolation as an ‘incurable’ in Bethlem Royal Hospital. Restrained to a wall by a mechanical device that made movement impossible, he was in frail health. Even worse, he’d been kept manacled on this iron device, alone, for ten years. The reason given for him being so severely restrained was that he’d been violent in the past. (Personally, being an American, far from home, and imprisoned in an asylum against your will might make anyone violent. Perhaps he wanted someone to listen to him, to believe him.) Ironically, when awareness of this patient was made known, six members of Parliament visited Norris. Each man stated Norris was rational, quiet, and capable of coherent and topical conversation. Based on Wakefield’s testimony and the illustration of Norris made public, he was finally released from his manacled restraint and isolation. However, the damage to his body and spirit had been done. He died, still a patient of Bedlam, a few weeks later. As more and more evidence was given in 1816, and the severe degree of continued inhumane treatment of patients was brought to the forefront of public awareness, as well as Parliament, Thomas Munro, principal physician (and grandson of James Munro), resigned in June of that year. Bethlem Royal Hospital continued onward, and still exists today. Situated on 270 acres in the London borough of Bromley, it strives to provide the most advanced and comprehensive level of quality care to patients. Needless to say, with the passing of 768 years since it first opened as Bethlem Royal Hospital, education, technology, medicine, and measures to diagnose and understand mental illness has grown to great heights. And the compassionate, humane treatment for those suffering from this condition have also improved tremendously. Still, when one hears the word Bedlam, an undeniable turbulent undercurrent of its scarred and haunting history remains. For more information about the History of Bedlam, here is an informative and chilling video that addresses the men placed in charge of the hospital, and some of the patients held at Bedlam.